Yesterday, GN Solids Control dispatch a big batch of solids control centrifuge & vertical dryer, with pumps, screw conveyors, spare parts etc, totally by 7 12meter long vehicles. The customers is international drilling company with large quantity of land rigs & some workover rigs. After tested GN centrifuge in jobsite, this old customer buys more and more solids control equipment package from us from last year. 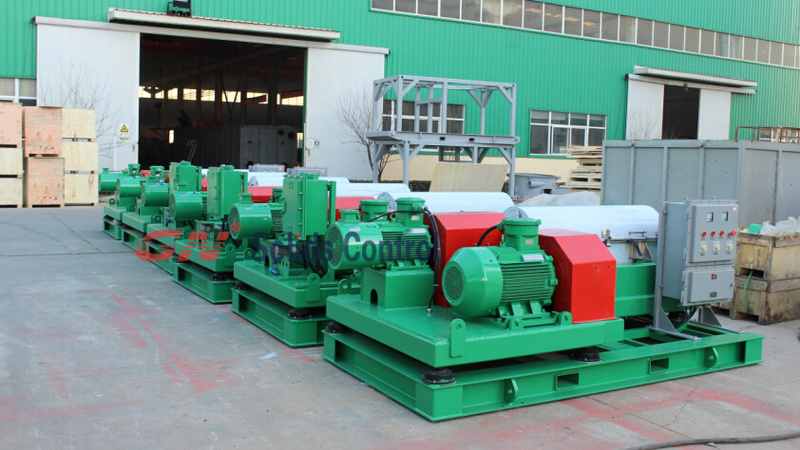 1) 6 sets decanter centrifuge, which will be used for 3 rigs. The centrifuge will be used for barite recovery and mud weight cutting. GN Solids Control centrifuge learn and upgrade many highlights from Alfa Laval, the good frame centrifuge brand from Germany. Now, we have upgrade to 3rd generation centrifuge. The price is good and performance is much better than before. 2) 3 sets vertical cuttings dryer, which will be used for 3 rigs. The no pit drilling projects require on line drilling cuttings management equipment. Verti G dryer is core equipment. We have variable speed verti G dryer and fixed speed verti G for both option. 3) Large quantity of screw conveyors. This screw conveyor is used for transferring the drilling cuttings waste from shale shaker, mud cleaner to verti G dryer. Generally, 3 sets of screw conveyor is requested, two level conveyor and one incline conveyor. 4) Large quantity of screw pumps. The pumps are used for transferring mud back to active tank. 5) Large quantity of variable speed control panel with ABB transmitters. GN Solids Control technical team with experienced technician can design and produce the patent variable speed control panel with smaller footprint and easier user operation steps. Except for traditional solids control equipment & drilling waste management equipment, GN Solids Control is also developing solidification units & thermal desorption units, which can be last step of drilling waste management. These two type of equipment will be put forward to market end of this year. Hope we can support more to this drilling waste management market.